Use in the non-pregnant mare is commonly based upon increasing uterine contractility to facilitate clearance of fluid. The correct dose of oxytocin causes a pulse of progressive uterine contractility that helps move free fluid out of the uterus. However, too high of a dose of oxytocin (> 30IU) will cause a tonic contraction of the uterus and prevent the evacuation of fluid. In our clinic, we use 20 IU (1ml) of oxytocin in the muscle every 4 hours. Oxytocin has a half-life of only 6 minutes. That means every 6 minutes, 50% of a dose is degraded and no longer active. With such a short half-life, more frequent administrations of a lower dose can have a better effect in uterine clearance. 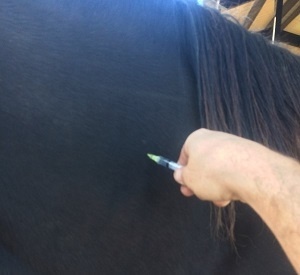 I routinely use oxytocin therapy in the 48 hours following breeding a mare to help with normal fluid accumulation following breeding and to help remove any remnants of uterine therapy such as infusions of antibiotics or uterine lavages. Mares produce fluid in their uterus as a normal response to breeding. If this fluid persists after 24 hours following breeding, she may be termed “susceptible to Post Mating Induced Endometritis (PMIE).” A common therapy utilized is intramuscular oxytocin administration to help fluid clearance. I will also administer oxytocin both intramuscularly (and possibly in the uterus in lavage fluids) to help a mare clear abnormal fluid accumulation. I also routinely use oxytocin in post foaling mares to help clear any lochia or normal post-foaling debris, during retained fetal membrane therapy and following lavages preparing mares for foal heat breeding. Small and frequent doses of oxytocin are a first line therapy to help mares that have not passed their placenta within three hours of foaling. The smooth muscle contractions induced by the oxytocin facilitate the passing of the retained fetal membranes as well as clearing bacterial and inflammatory debris that can accompany retained membranes. Oxytocin also has some therapeutic actions in the maternal bond and developing mothering ability and can be used to augment a mare’s behavior towards her new foal. 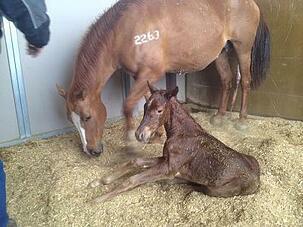 It should be noted that a post foaling mare has a high up-regulation of the oxytocin receptor. This effect means a smaller dose of oxytocin has a much greater effect. In post-foaling mares, I only use 5-10 IU of oxytocin at a maximum. Now, there is a major caveat. Oxytocin, can have a profound effect on a pregnant mare. If administered at the correct timing, it will induce delivery (or premature delivery) of a foal. If inadvertently administered, a late term mare will be induced into parturition, having devastating results to both the mare and fetus. There are a few other uses of oxytocin which involve medical conditions related to esophageal choke and estrus suppression (described in our article Suppression of Stallion and Mare Behavior).